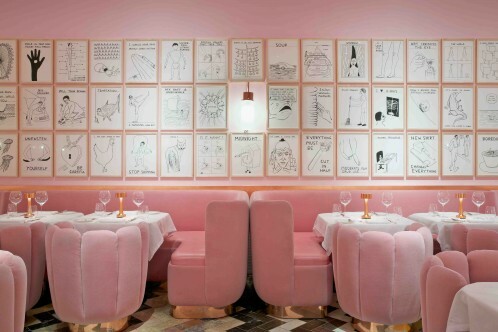 British artist, David Shrigley transformed the gallery restaurant at sketch into a piece of art. 239 new works line the restaurant’s walls, forming the largest group of original drawings David Shrigley has ever exhibited. The drawings, touching on the grand themes of life, death and beyond, will offer points of departure for diners to muse on. The exhibition continues to the restaurant tables: Shrigley has understood the dining table as an auxiliary exhibition space, a platform for the presentation of new work by himself and Master Chef, Pierre Gagnaire. 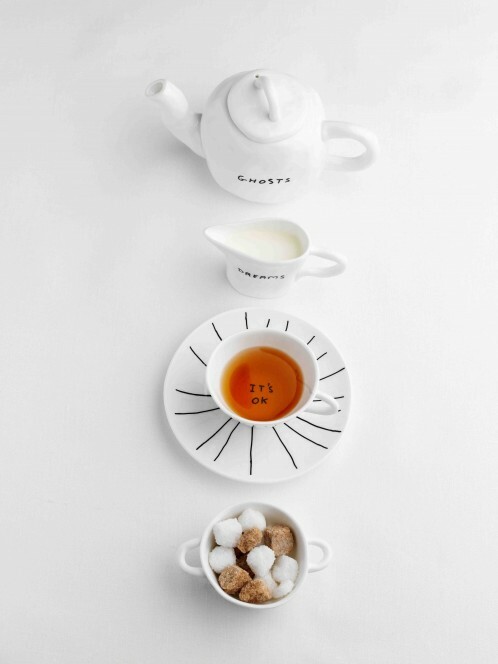 The work comprises new ceramic tableware, manufactured by British heritage brand Caverswall featuring Shrigley’s distinctive mordant drawings and texts, in a holistic interaction with Gagnaire’s food. To give the drawings and ceramics room to breathe, Paris-based architect and designer India Mahdavi has conceived a clean, strikingly simple interior that updates an archetypal brasserie design with a very contemporary splash of pink on both walls and velvet-covered custom-made furniture. The classic, almost bourgeois design invites a deliberately playful contrast with the witty, outré art works; all is most certainly not what it seems.